One of the best ways to get to know a city and neighborhood is to take a guided tour. 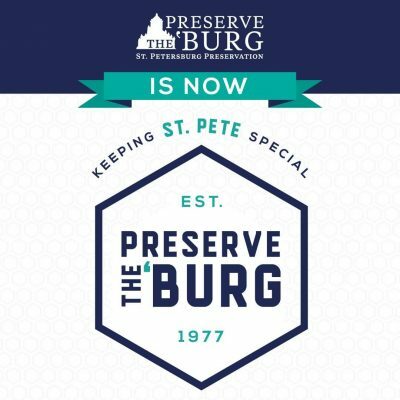 Preserve the Burg, formerly St. Pete Preservation, offers a regular schedule of interesting and fun walking and biking tours. The regular Saturday tour season runs October through April – locations vary. Tours start at 10am (except the Gulfport tour which starts at 3pm). Starting in May, Twilight on the Town summer tours will begin. Tours last about two hours with numerous stops. Walkers are encouraged to wear sturdy walking shoes and bring water. Cost is $10. Be sure to check PTB’s website www.preservetheburg.org on the Calendar page or call 727.824.7802 for more information. Reservations are highly recommended as spots fill up quickly. Fourth Saturday of the Month – Meeting place: Craftsman House Gallery, 2955 Central Avenue. This popular tour includes a stop inside one of the neighborhood’s restored bungalows. Afterwards, guests can choose to enjoy a drink or lunch at the Craftsman House, an American crafts gallery and café. Second Saturday of the Month – Meeting place: SE corner of 1st Avenue S and 1st Street, next to the Saturday Morning entrance. You will learn about the civic visionaries who transformed a working waterfront into one the largest waterfront park systems in the country. First Saturday the Month – Meeting place: SE corner 1st Avenue S and 1st Street, next to the Saturday Morning entrance. Take a trip through downtown St. Pete and see its grand hotels, stately churches and architectural treasures such as the Open Air Post Office and Williams Park. Third Saturday of the Month – Meeting Place: Gulfport History Museum, 5301 28th Avenue S., Gulfport. Stroll through funky, artistic and historic Gulfport and look at its collection of historic commercial and residential structures. This tour is led by a Gulfport local.